Join Jossec Tours and Safaris for a once-in-a-lifetime opportunity to visit Maasai Mara Game Reserve and see all the Big Five, flamingos, and white rhinos and other spectacular animals. Finish your safari with a visit to the Crescent Island Game Park located in Lake Naivasha; it is one of the best beautiful parks in Kenya, and you will have a boat ride. You can join as a single traveler, a couple, or a group. You will also meet with other travelers from all over the world. Jossec Tours and Safaris has daily departures. The safari exposes you to various, almost all wild animals. 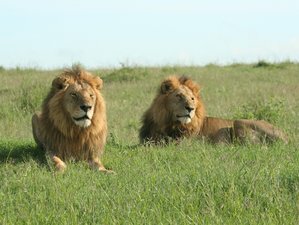 In Maasai Mara, you will see all the Big Five and many other animals. In Lake Nakuru and Lake Naivasha, you will have a chance to see much variety of birds and also visit the Crescent Island which is a rare kind of Kenya. You will be accommodated in various accommodations provided by Jossec Tours and Safaris. On day one and two, your overnight will be at Rhino Tourist Camp in Maasai Mara National Reserve. On day three, you will stay at Lanet Matfam Resort in Nakuru. Meanwhile, on day four, you will stay at Taphe Guest Resort in Naivasha. Jossec Tours and Safaris' driver and staff will pick you up at the hotel / airport in the morning, a short safari briefing will be conducted. Then, you will depart from Nairobi by road heading through the viewpoint of the Great Rift Valley escarpment and have a stopover at the Great Rift Valley escapement for viewing. Another stopover will be for lunch at Narok Town continued with the safari to Maasai Mara National Reserve. Arriving in the afternoon, check in, and then proceed for the evening game drive. Maasai Mara National Reserve is the Kenyan best-known park for the Big Five, leopard, lion, rhino, elephant, and buffalo. It is also the home of many wild animals like hyena, giraffe, eland, wildebeest, zebra, impala, Thomson’s and grant gazelle, and much more African wild animals. Dinner and overnight will be at Rhino tented Camp. On the second day, you will wake up in the early morning for the full breakfast, then proceed for the adventure in the park for the animals viewing. Maasai Mara National Reserve has a high concentration of wild animals and this makes the adventure amazing and joyful. Picnic lunch will be served at Mara River and there will be an optional visit to the Maasai Village to witness the dancing and singing by the Maasai warriors and women. You will have a glimpse into their homestead and opportunity to take the picture of the home and of the Maasai warriors. Dinner and overnight will be at Rhino Tented Camp. You will have an early morning game drive inside the Maasai Mara National Reserve. After the morning game drive, you will return to the camp for the full breakfast then depart for Lake Nakuru by road. You will have lunch en route, arriving in Nakuru in the evening, and time for evening game drive at Lake Nakuru National Park. Dinner and overnight will be at Lanet Matfam Resort. After early morning breakfast, proceed for a game drive in Lake Nakuru National Park known for its millions of flamingoes and other waterbirds including yellow-billed Pelicans, Marabou Storks, Hammerkops, African fish eagles, goliath heron, pied kingfisher, and Verreaux eagle etc. You will leave Nakuru after lunch for Naivasha arriving at late afternoon, visit the Crescent Island where you get there by boat to have a walking safari in the park to see the animals such as giraffe, zebra, and antelopes. Naivasha is also known for the many birds. Dinner and overnight at will be at Taphe Guest Resort. After breakfast, you will check-out and leave for Nairobi; making a stop-over along the way to take in and enjoy the beauty of the Great Rift Valley viewpoint. Upon arrival in Nairobi, you will be taken to your hotel or to the airport for your flight back home. This safari journey will cover three places in Kenya, including Maasai Mara National Reserve, Lake Nakuru, and Lake Naivasha. You will be served daily breakfast, lunch, dinner, and free bottled water. Jossec Tours and Safaris offers affordable camping and luxury safari tour package to the most beautiful unexplored East African parks.